Today we are giving away one of our favorite fabric design tools– a Wacom Intuos Pen & Touch Tablet! With a digital drawing tablet artists can draw and create directly on the computer and manipulate and correct digital photos and scans of hand drawn artwork. Enter by 10am tomorrow, December 13th, for a chance to win! We will announce the winner on the blog tomorrow and announce our final giveaway of our 12 Days of Giveaways! Congratulations to Penny Hajiantoni– day ten's winner! Handmade Wedding Book Bundle Giveaway! 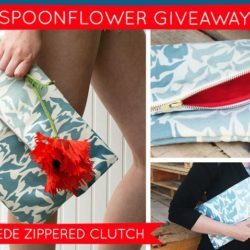 Win a Clutch from Yours, Olive! Wonderful giveaway. Thank you so much. Love spoonflower. What an awesome company! I just found you via Google looking to design some fabric and I’ve been in awe of the fantastic reviews. I will definitely be sharing! Now that looks like a great tool for the designers toolbox!!! Thanks for the offering. Merry Christmas! Wow great give away! That will make my designs amazing! Thanks for the great giveaways, Spoonflower. And Happy Christmas! A Wacom tablet is a very generous prize. Thanks very much! Yay! I see zentangles made with this nifty little prize!